If you attempt to use your lawn mower and find that it isn't working as it should, the problem may be related to a clogged or corroded carburetor. A lawn mower may refuse to start particularly after a long winter of sitting unused or a period of time during which it was filled with gasoline but not turned on. Fortunately, cleaning and adjusting the mower's carburetor is a simple task that can be undertaken at home for a small cost. To determine whether the carburetor is, in fact, the problem with the lawn mower, try applying into that part of the mower a short burst of aerosol lubricant or a cleaner designed for the carburetor specifically. Next, attempt to start the mower. If you're able to do so, the problem is somehow related to fuel rather than to the engine. Even if the mower starts and won't keep going, the fact that it starts at all means that the engine is in good shape. Next, try to remove the fuel line where it goes into the carburetor. Gasoline should leak out at both ends. If it doesn't, either your fuel line or fuel filter is clogged. You should also check the air filter. 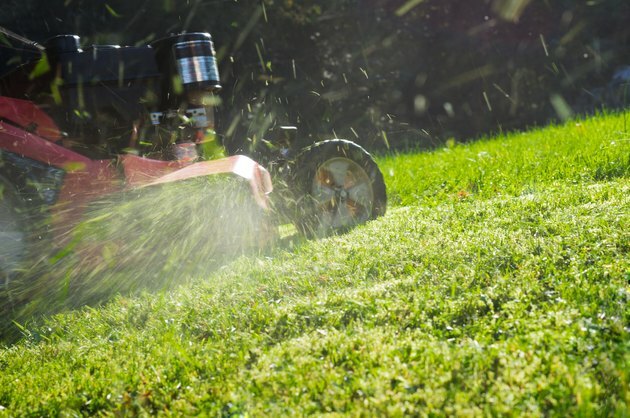 This is one of the most common causes of lawn mower problems. A filter that is clogged with dust or debris may cause smoke to emanate from the mower during use. The carburetor should be attached to the engine with bolts. Use a socket wrench to remove these bolts, then the carburetor itself. You may wish to place the part into a bag or disposable bowl as fuel may leak out at this point. Inspect the carburetor for signs of corrosion. If you see any, you will need to replace the part. If not, it's possible to rebuild it using a kit. This won't always yield a cost savings, however. Also, check to verify that the carburetor was fastened securely, both to the mower and internally. All of its parts should be tightened together firmly. Over time, these connections can loosen as the mower is used. Carefully take apart the carburetor, photographing how the pieces went together, if possible. These will be helpful when you later reassemble the parts. Once all of the pieces have been separated, place them in a container filled with carburetor cleaner. Let them soak for an hour or as long as the manufacturer's instructions indicate. Once that amount of time has elapsed, rinse the parts with water and dry them with compressed air. Be sure that all water has completely dried before reassembling the carburetor and mounting it on the mower once again.